So ever since I saw an ad in TimeOut Dubai about L'Atelier Des Chefs Dubai, I've been wanting to take a cooking class there. The macaroons class is what instantly took to my fancy as I love EATING macaroons and the planned recipes looked scrumptious. 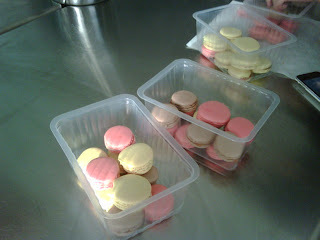 I also made macaroons once and although it tasted good, the shape and texture weren't really great. I learnt some very interesting tips at the class when it comes to making macaroons themselves and also when it comes to making sauces and fillings. Everything is very clean and organized at the kitchen everyone gets a sufficient chance at contributing to final dish. I can't wait to make these macaroons myself now after taking the class! please let me know if you tried making them at home and did it come out perfect?? ?